When it is time to add a piece of jewelry collection, you don’t always have to buy new pieces. In fact, you should consider adding antique or estate jewelry to your collection. Unlike some newer pieces, estate jewelry offers a large variety of styles to fit any personality and any budget. jewelry. Compared to typical contemporary pieces that everyone is wearing, these vintage pieces are made in a distinct manner and style that will allow you to stand out from the crowd. Also, vintage and estate jewelry holds its intrinsic value, meaning they are a treasure that can be passed down through generations. Searching for estate jewelry is something that can be intimidating, especially if you do not know much or have experience. To help you have more success finding great pieces, we put together some helpful tips to follow when shopping for estate jewelry. One of the most helpful things you can do before buying estate jewelry is to understand the different trends and periods throughout history. You can find plenty of information online that explains the different periods and trends of jewelry throughout the years. By knowing these different jewelry eras, you will better understand why different pieces look a certain way or which era they came from. Plus, it will It is also beneficial to study some of the jewelry trends throughout the years so that you are aware of the differences you will inevitably see from modern jewelry. Lastly, understanding these different eras will also help you identify which types of pieces will be more in line with your style. When shopping for antique jewelry, it is important to carefully evaluate the condition of any items you become interested in. Be sure to closely check for any cracks, chips, or other imperfections in the stone or enamel. Additionally, keep an eye out for any corrosion, holes, cracks, or discoloration in the surface of gold and silver estate jewelry. Unlike scratches, these damages cannot be repaired and can significantly affect the value placed on the item. Ideally, you will want to purchase pieces that are in very good or mint condition in order to retain their value for many years to come. Estate jewelry is often replicated using cheaper materials. To ensure you do not get scammed with one of these pieces, be sure to look out for certain signs. A significant sign that estate jewelry might be a fake is any discrepancies with the marks and signatures. Most jewelers are known to leave a maker’s mark somewhere on the piece. Use a magnifying glass or jewelry loupe and be sure to examine each piece carefully for these marks. Other signs include the age of the piece and whether or not it is associated with a pattern or style common of the time period. To ensure you are buying real pieces, it is best to shop for items sold by a reputable store or seller. By following the three tips above, you will be much more likely to find beautiful and unique estate jewelry pieces to add to your collection. 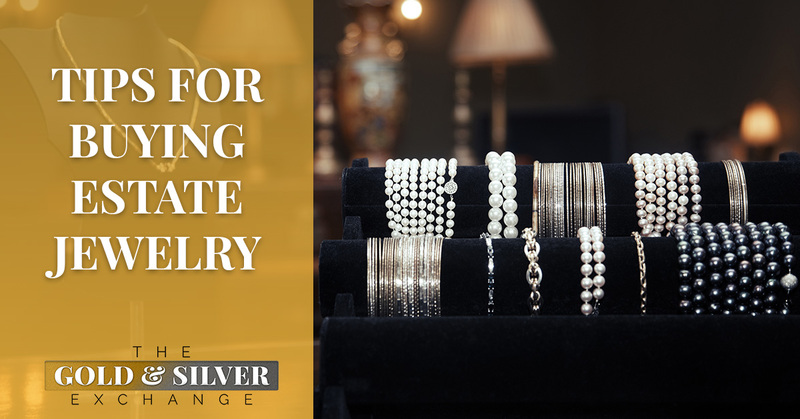 If you are looking for jewelry stores in Grand Rapids that sells antique or estate jewelry, The Gold and Silver Exchange is the place for you! We have a variety of estate jewelry pieces, like necklaces, bracelets, and more! All of the items we sell are carefully inspected to determine quality and value. To learn more about estate jewelry pieces, contact us!